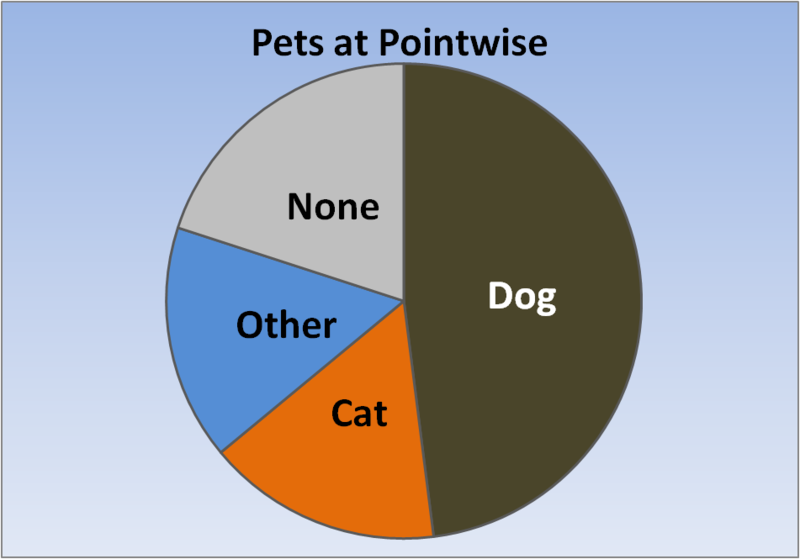 This informal poll of pet ownership among Pointwise employees tells me that we’re pretty pet-friendly. Over three quarters of us have one type of pet. Several people have more than one. This compares favorably with the population as a whole where 62% of U.S. households own a pet. Dog ownership is highest (nearly half of all pets) followed by cats and other types of creatures (mostly fish). I fall into the pet-less category only because I’m between Betta fish right now. The poll does not count the copperhead snake someone found in their yard a couple of days ago. Are there a lot of pet owners among your coworkers? Do you have a pet friendly workplace where folks can bring their dogs to the office? 1. Do undergrads count as pets? 3. I spend all night with them lying on my feet, why would I want them there during the day too? 4. Would they get along better with my co-workers’ pets than my co-workers get along? 1. Based on my own sons, yes undegrads can be counted as pets. 2. It’s not clear to me what cats care about. 3. if I had cats I’d probably agree.